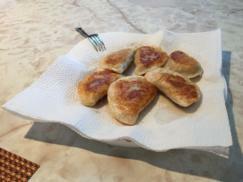 Pyrohy or perogies are dough pockets filled with potato, or potato and cheddar cheese, or kapusta (sauerkraut). 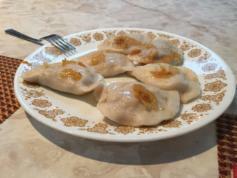 They are boiled and vaguely resemble Italian ravioli, Polish pierogi, Jewish kreplach, or Chinese wonton. They are often served with onions and sour cream. Mmmmm. Holy Ghost Church makes pyrohys "in-house" as a fundraiser and a way to bring the parish together for a fun and worthwhile project. The initial "Pyrohy Sale" was held in November 2007 and has been a huge success ever since! Please contact Fr. Daniel Troyan at the Holy Ghost Rectory (610-252-4266) to place your orders for pyrohys. The cost is $6 per dozen. Thank you for all your help, dedication and patronage! ...and remember, you do not have to be a member of Holy Ghost Church to purchase pyrohys...EVERYONE IS WELCOME! A short photo album is included below from Pyrohy Sales...enjoy!